Bristol Sound and Vision Show 2016 in pictures | What Hi-Fi? We’re back from another year at the annual Bristol Sound and Vision Show, which yet again proved to be the place to be to see and hear the latest in hi-fi and home cinema. 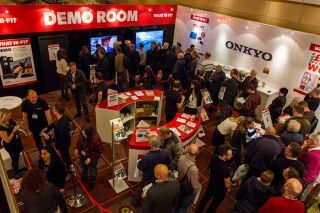 And this year there was certainly plenty to see, with several new launches from the likes of ELAC, Mission, Quad and Rega, among many others, plus the first chance to see many new products, from the likes of Sony and Technics. If you couldn't make it to the show, we've rounded up what you missed with a selection of pictures of the best things on show. You can also check out our full round-up of Bristol Show news coverage. Arcam had its new Solo Movie and Solo Music systems on display, as well as the second generation irDAC. But perhaps the most exciting thing the Cambridge-based company brought to Bristol was its £80,000 home cinema system, using the new AVR850 to handle Dolby Atmos. It sounded so good that The Clarity Alliance named it best cinema room of the show. Astell & Kern had the Copper edition of the AK380 hi-res audio player at its Bristol Show stand, but also had a room dedicated to a complete AK500 system, comprising the AK500N network player, AK500A power amp and AK500P power supply. With prices starting at £13,000 it's certainly a serious system. Audiolab's 8300N network player and 8300XP power amplifier, the latest additions to the 8300 series, were unveiled alongside the M-One integrated amplifier with built-in DAC. As promised, Audio Technica brought three new turntables to the show: the AT-LP5, the AT-LP60BT and the AT-LP120-USB. Atacama's extensive range of racks and speaker stands included the Award-winning Evoque Eco 60-40 Special Edition rack and Moseco 6 stands. Audioquest certainly had a good looking room for its DragonFly and Beetle DACs. The Clarity Alliance agreed and named it the best presented room of the show. The new 800 Series Diamond speakers were the main draw to B&W's room. The range has been virtually redesigned and built from scratch, and prices start at £4500 for a pair of standmounters and £3000 for the new centre-channel speakers for home cinema applications. Bryston was keen to show off its new BDA-3 DAC with DSD decoding, along with a new range of Cubed power amplifiers. Bryston shared its room with PMC, which brought two new centre speakers, part of its Fact series, to the show. Canton is perhaps best known for its soundbases, but this year at Bristol it unveiled the new Reference K series of loudspeakers. With prices starting at £1499 and rising to £17000, they mean business. The new Innovation Basic turntable was the highlight of the Clearaudio room, especially since it had the world's first optical phono cartridge, the DS Audio DS-W1, attached to it. Creek Audio's new Evolution 100CD DAC/CD player combo had its first UK showing in Bristol. It was attached to Epos's new K5 speakers. Dynaudio had its new Emit range of affordable speakers on display, alongside the Limited Edition Contour series. Prior to the show, there was much hype surrounding ELAC's Discovery DS-101 music server, so it was good to get a closer look. The company also had its new Debut speakers connected to a high-end Moon system. KEF's room was full of gorgeous speakers, including the R Series and LS50s. It was another company to use Moon's Neo ACE all-in-one system as a source component. However many times we go to Bristol, we'll never tire of visting Michell's room. This year the Gyro SE, a more affordable version of the GyroDec, was on show. Mission's new affordable range of LX speakers was a highlight of the show, a £200 pair of bookshelf speakers that will be aiming to challenge our favourite budget speakers. Bristol marked the first time the new Platinum II series was shown off to the public. Standing over six feet tall, the PL 500 II towers were a dominant feature in the room. Monitor Audio's Bronze range was also on display. Moon's Neo ACE amplifier was a popular choice for many manufacturers at the show, but Simaudio chose to hook it up to a VPI turntable and Totem Acoustics speakers. The results were impressive. Naim's Mu-so and Mu-so Qb certainly drew in the crowds in Bristol for their first public showing in the UK. Naim also had a high-end system comprising its revitalised range of power amplifiers, partnered with Focal Sopra speakers. Pioneer gave its new A-50DA and A-70DA amplifiers their first public outing at Bristol and even used its XDP-100R hi-res portable music player as a source component to demonstrate the MQA format. Pro-Ject's 2 Xperience SB turntable, featuring a new S-shaped tonearm, was at the show, along with the RPM 5 Carbon and glow-in-the-dark 1 Xpression Carbon UKX. Q Acoustics brought the 3000 series - unveiled at last year's show - to its stand, along with the new Media 7000 2.1 channel speaker system. Quad had a couple of new launches for Bristol, in the form of the Z series loudspeakers and Artera One all-in-one system. The Z series improves upon the S series and the Artera One acts as an integrated amp, CD player and network streamer. One of the highlights for many attendees was Rega's brand new Planar 3 turntable. It features a wealth of upgrades over its predecessor as well as a new design. Roksan had a busy Bristol Show, including launches of the Radius 7 and Oxygene 30 turntables, and the new K3 DAC - the latest addition to the K3 series of components. A new Blak series of components was also unveiled. Sennheiser's new high-end HD 800 S headphones were the big draw to the company's stand, but its Urbanite and Momentum 2.0 ranges were also on hand to listen to. Tannoy's new Mercury 7 and Eclipse ranges were launched to celebrate the company's 90th birthday. Technics gave visitors to the show a closer look at its new Grand Class SL-1200G turntable. We also managed to speak to Technics' CTO to discuss the high price tag and the possibility of a cheaper model in the future. Wharfedale unveiled a new active pair of its Diamond 220 speakers at the show, which connect to a central control hub handling power and sources. We were also given details of a new Reva range of speakers, but were told to expect more in the coming months. Hopefully you were able to visit the What Hi-Fi? stand in the Bristol Suite. Our demo this year looked at the advantages of HDR technology, using 4K OLED and 4K LCD/LED screens for comparison. And finally, Yamaha had its full range of MusicCast wireless multi-room speakers for you to take a peek at, as well as the YSP-5600 Dolby Atmos soundbar.